The more satisfied independent insurance agents are with a carrier, the more business they will conduct with that carrier. Despite this fact, which is clearly evident in the J.D. Power 2019 U.S. Independent Insurance Agent Satisfaction Study,SM released today, overall agent satisfaction with the service they receive from insurers is among the lowest of business relationships measured by J.D. Power. The second annual study, which was developed in alliance with the Independent Insurance Agents & Brokers of America (IIABA), evaluates the independent P&C insurance agent's business outlook, management strategy and overall satisfaction with personal lines and commercial lines insurers in the United States. "Each of the highest performing carriers in our study have taken different approaches to the market – some have focused on regional success, while others have emphasized price or service," said Tom Super, Director, Property & Casualty Insurance Practice at J.D. Power. "What they all share is a common understanding of the linkage between agent satisfaction and improved business outcomes—recognizing what drives agent satisfaction, then being laser-focused on getting that right." "A strong partnership between Trusted Choice independent insurance agents and their carriers is critical to achieving a great consumer experience," said Bob Rusbuldt, president & CEO of the Independent Insurance Agents & Brokers of America. "Carriers that focus on ease of doing business achieve high satisfaction scores from agents. Ultimately, carriers that invest in their agent platforms benefit from a distribution force that has more time to spend providing value-added service to customers rather than back-end administrative tasks." Auto-Owners Insurance ranks highest among personal lines for the second straight year, with an overall satisfaction score of 800. Progressive (762) ranks second while Safeco and Travelers rank third in a tie with 737. 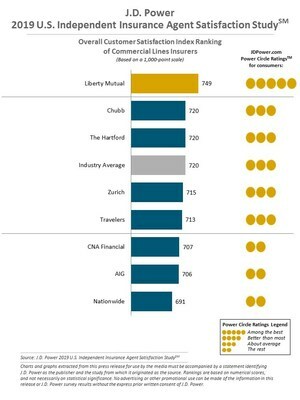 Liberty Mutual performs highest among commercial lines for the second straight year, with an overall satisfaction score of 749. Chubb and The Hartford rank second in a tie with 720. The J.D. Power 2019 U.S. Independent Insurance Agent Satisfaction StudySM surveyed 1,466 P&C insurance independent agents for a total of 1,561 evaluations of personal lines insurers and 1,193 evaluations of commercial lines insurers that they had placed policies with in the prior 12 months. The study was fielded from September through November 2018. For more information about the U.S. 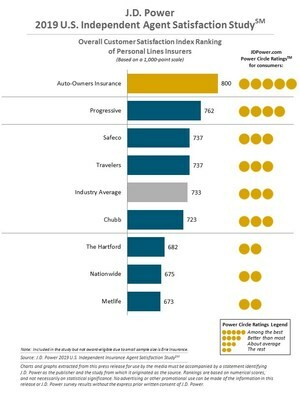 Independent Insurance Agent Satisfaction Study, visit https://www.jdpower.com/business/resource/us-independent-insurance-agent-satisfaction-study. See the online press release at http://www.jdpower.com/pr-id/2019012. Founded in 1896, the Independent Insurance Agents & Brokers of America (IIABA or the Big "I") is the nation's oldest and largest national association of independent insurance agents and brokers, representing a network of approximately a quarter of a million agents, brokers and their employees nationally. Its members are businesses that offer customers a choice of policies from a variety of insurance companies. Independent agents and brokers offer all lines of insurance—property, casualty, life, health, employee benefit plans and retirement products.